Blog Guidebook: Linky Tools a.k.a. MckLinky Alert!!! Linky Tools a.k.a. MckLinky Alert!!! If you have just signed up, you have a 30 day trial period and this Feb 7th date does not apply to you. We have not received an email or any information on this "deactivation"! There are so many linky parties out there, I am concerned that some people's linkies will be gone and they won't know about it! Tell all your bloggy buddies so they can find a new free linky source or pay the $24 a year for a Linky Tools subscription (not a bad price for great service!). It would be great if we could all support Mr. Riggs' great service to all us linky party lovers and blog hoppers! InLinkz is the most powerful and customizable linking service. It supported thumbnails long before linky tools did and has many configuration options. There is also a linkytools import tool so users migrating from there, will not need export or loose their old linkies. I published my first linky list last night and I spent some time trying to figure out which service to use. I knew that I wanted a linky list that included pictures. When comparing Linky Tools and InLinkz, I felt like Linky Tools had what I needed. Either way, you pay a small price for the service. It seems reasonable considering all the effort put into programming and management. I'm new to Linky Tools, so I had already seen the information on the upcoming changes. It's too bad the owner didn't contact current users to let them know, but he must have assumed that regular users would see the notice when they logged in. 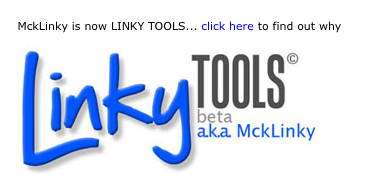 The majority of linky tools upcoming changes are covered by InLinkz since the dawn of InLinkz. You will also notice that the difference in image quality is huge between the two link services. You can check your own links and these here: www.inlinkz.com/testBed.php for a general comparison. And you won't have to commit for a whole year in advance. Anyway, enjoy your stay wherever you choose to commit. I'm a brand new blog and I can't afford to pay the fees =( I wish I could support the linky site b/c it really is quite wonderful! I just have zero income coming in off my blog. Hi. I am using Simply Linked right now, but I HAVE NOT been able to figure out how to import (or export) my Linky list from Linky Tools to Simply Linked. Any suggestions? I'll try it and see what happens and let you know.